The late afternoon light must have looked the same to him, I thought, and irises, after all, are still irises, no matter what century they’re viewed in. More than a hundred years after the death of famous artist Vincent Van Gogh, his influence lives on. As I picked up my palette and brush in the Amsterdam studio, near his old haunts, I could almost imagine Vincent himself looking over my shoulder. He wouldn’t have been impressed by my painting skills, but I’d like to think he’d have been pleased to see the roomful of wannabe artists learning about his techniques from the resident experts at a tiny Amsterdam studio and trying our hands at recreating his style. Learning Van Gogh’s techniques at an art workshop in Amsterdam. Photo credit: Liz Fleming. 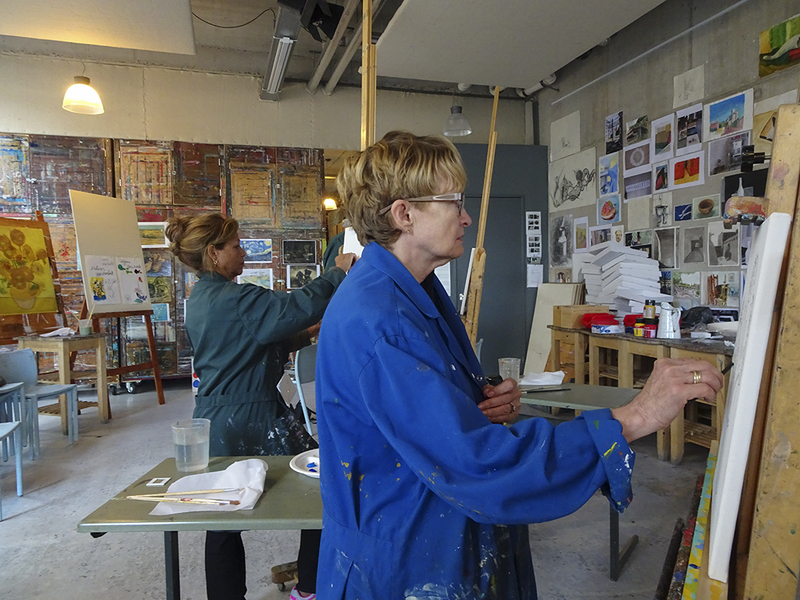 This unusual painting afternoon was just one element in the hands-on, full-on immersion into Dutch and German culture that characterized our Avalon Active Discovery cruise from Amsterdam to Nuremberg. Though the itinerary of charming ports was familiar, Avalon’s innovative approach to exploring and experiencing the landscape, the cuisine, and the culture was refreshingly new. Recreating Van Gogh’s brushstrokes was only the beginning. After we’d wiped the paint from our hands, our guide took us on a completely different voyage of discovery through the old streets of the city, to some of Amsterdam’s finest foodie spots. We learned to hold a slippery pickled herring by its tail and lower it carefully into our mouths, as the Dutch do, and then discovered that we’d all been quite hideously mispronouncing the name of Holland’s most famous cheese. Gouda isn’t pronounced “goodah”. It’s “how-dah”. No worries – it’s delicious no matter how you say it. Transitioning from cheese to chocolate, our guide led us to a tiny shop where a wonderfully mad chocolatier spends his days crafting tiny, delectable Gucci bags and other designer look-alikes out of chocolate. So beautiful, they were almost too precious to eat – almost. We gobbled every creative morsel, then washed them down heartlessly with a chaser of Dutch, salted licorice. A fully-translated tour of Amsterdam’s iconic canal system and an impromptu Indonesian ‘rijstaffel” – a rice table dinner – an important part of Dutch culture, thanks to their long history with that part of the world – rounded out our first two cruise days and set the entertaining tone for the rest of the tour. 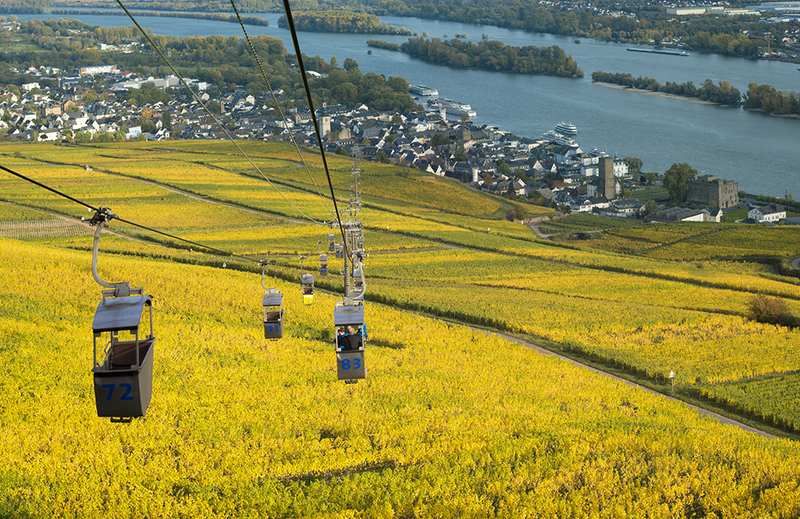 Spectacular views from the cable cars near Rudesheim, Germany. Photo credit: Avalon Waterways. Each port offered a new surprise. We spent one glorious fall afternoon riding an open-air lift up a mountainside near Rudesheim, Germany, soaking up the scenery and filling our memories (and our memory cards! ), then strolling down through a lush vineyard, chatting with pickers, tasting sun-warmed grapes, and watching the exacting farmer and vintner as they carefully checked their harvest. One morning, like crusaders storming the castle walls in Miltenberg, we hiked up a hillside to explore the ancient ruins, then returned to the town below where we were rewarded for our efforts with a tasting of the local wurst – which we thought was actually the best! Our tour in Wurzburg took us along Roman roads to the castle of the bishop with its gorgeous gardens and bloodcurdling stories of what happened to those who displeased the mighty man – nasty but fascinating. Along our various routes, we sampled local foods and even found ourselves in the tasting room of a family winery for a just-us sampling of their very best. A bike ride through Bamberg on our last day began with a very interesting introduction to the area’s Salem-like history of witch-burning and was topped off with a giant hand-twisted pretzel and a glass of beer at an ancient brewery. 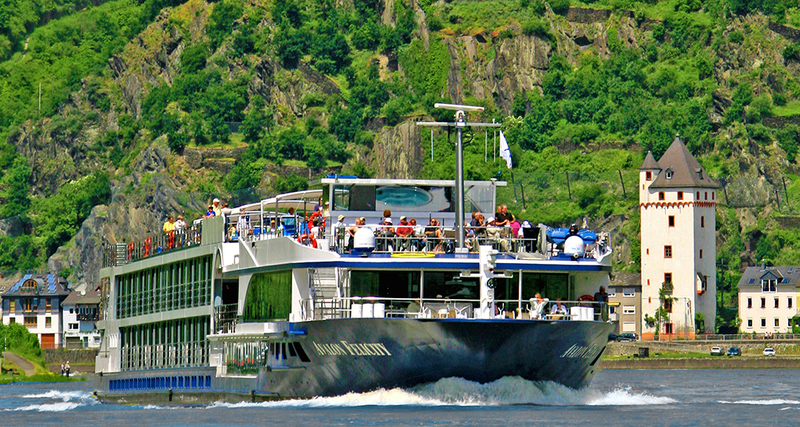 Avalon Felicity sails past Berg Castle on the Rhine. Photo credit: Avalon Waterways. Although the Avalon Felicity can accommodate 138 guests, not everyone joined us on the tours we’d selected. Avalon’s Active Discovery program, after all, is about choice. Each day, three all-included options were available – one geared to the more active traveler (hiking, biking etc. ), one for the guests interested in an immersion in the local culture or history etc., and a more standard guided walking or coach tour. Guests were free to decide which best suited their interests and the process of natural selection seemed to create a pretty even division, meaning that none of the tours felt overcrowded. Back on board each evening, dinner table conversation was always lively because everyone had a different story to tell about the day’s adventures. The ship itself is elegant and well-designed, with a gracious dining room and lounge, as well as a spacious upper Sky Deck. Huge expanses of glass in all the public areas, in addition to the wall-to-wall panoramic windows in all staterooms seem to envelope the beautiful landscape you sail through. In the dining room, chefs eager to make each meal an experience, offer generous buffet feasts at breakfast and lunch, while at dinner a menu of wonderful choices, based largely on locally sourced recipes, make it hard to decide. Beginning in 2019, Avalon guests will enjoy Flex, a new program that will offer open dining times, more tables for two, bar service on the Sky Deck and daily night fare at the bar. For those looking for a romantic get-away, the chefs will even be happy to pack picnic lunches! Panorama Suites are featured on every Avalon ship in Europe in 2019. Photo credit: Avalon Waterways. Also beginning in 2019, as a special feature for the more active cruise guests on all European cruises, the company will add the services of an Avalon Adventure Host. Based in a new Adventure Center, the Host will help guests sign out bicycles, grab Nordic walking sticks, arrange a kayaking excursion on the river or find a complimentary fitness class on the Sky Deck. Another great 2019 innovation will be the introduction of the most dynamic special interest cruises to date, featuring in-depth tours of breweries and wineries, visits to Christmas markets and Jewish heritage sites, explorations of tulip gardens and castles, golfing a great courses and more. Also in 2019 – the 75th anniversary of the Normandy invasion – there will be itineraries that honour our proud WWII history, and if you’re a Jann Arden fan, you’ll be able to cruise with this world-famous Canadian singer. In 2020 you can enjoy a once-in-a-decade performance of the Passion Play by the villagers of Oberammergau, Bavaria. In terms of passion, whatever yours may be, Avalon has a cruise for you. On board the Felicity, the mood is immersive, as if the goal each day is to bathe us in all that’s best and most interesting about the Rhine and her surroundings. While every day offers gloriously self-indulgent opportunities to slip into my luxurious suite, flop on the all-too-inviting bed and watch the shore glide by, my favourite afternoon onboard the Felicity is spent lolling on the Sky Deck as we sail through the jaw-dropping Rhine Valley. With an abundance of remarkable castles at practically every bend in the river, it’s a regal way to experience Germany. IF YOU GO: The Active Discovery cruises have proved so popular that Avalon has expanded to include itineraries on the Rhine, Danube and Rhône Rivers, offering guests “Classic,” “Discovery” and “Active” options on each. A new AvalonGo App invites independent travelers to explore destinations on their own, with detailed, daily itineraries, a list of nearby attractions (featuring hours of operation, historical facts and more), maps, directions as well as local cafés, restaurants, bars and entertainment options. 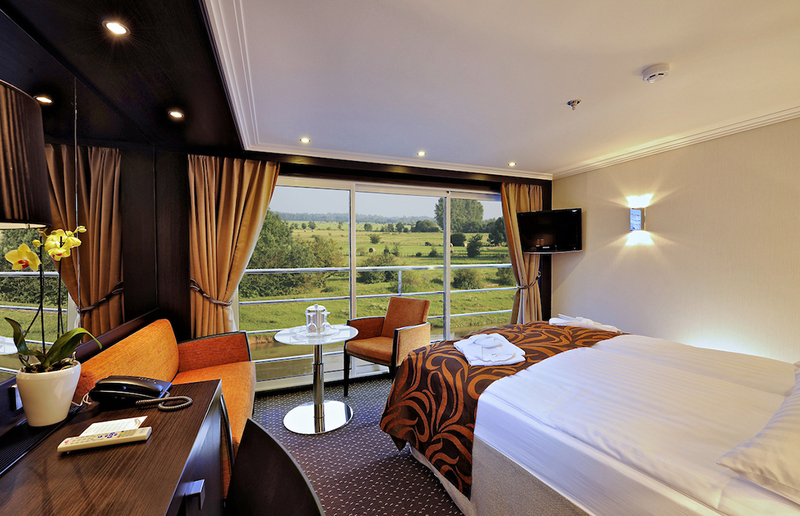 For more information, visit www.avalonwaterways.com and see your preferred travel professional. Written by Liz Fleming. Originally published in Cruise & Travel Lifestyles Spring/Summer 2018 issue. Main photo: Koblenz, Germany.